Most people understand the hairremoval landscape and know what’s available to get rid of unwanted hair. Shaving, waxing, epilation, depilatories, and, of course the professional permanent laser hair removal. The trend for permanent hair removal is epic and unlikely to depart. After all, who wants to shave everyday? And although professional laser hair removal is an amazing solution, it can be both costly and inconvenient. So, can you achieve permanent hair removal results at home? In short, yes. Yes, you can achieve permanent hair removal at home. But, it isn’t going to be easy and it isn’t for everyone. Laser hair removal works differently on individuals based upon skin tone and hair color. The procedure is most effective for those with lighter skin and dark hair, which is a bummer if you don’t fall into that category. The Makeup Examiner had already experienced professional laser treatments, so I was fairly confident that TRIA would work on my skin, but I wasn’t sure if I would be able to achieve the same results. Before I share my experience, allow me to explain what TRIA is. The TRIA Laser Hair Removal Device ($449) is an FDA-approved laser hair removal device that provides easy, safe and convenient hair removal in the comfort and privacy of your own home. It looks like a hair dryer and is about as heavy as one. TRIA has a failsafe, as you must first activate the unit via an 800 number. The unit also has a built in skin sensor which has to be unlocked prior to each use. The sensor is held against the skin and will unlock based upon your skin tone. If your skin tone is too dark, the device won’t unlock. But, TRIA offers a money back guarantee that includes shipping. If you can get past all of that, then the real fun begins. You may have heard about the pain involved with laser hair removal, but as with all things this simply depends upon the person. I chose my underarm. I didn’t feel any pain stronger then a slight pinch, kind of similar to a rubber band snap, and this was only in certain areas. As for time -- TRIA isn’t an overnight treatment (I began in November) but I saw results after the first treatment. After six treatments with the TRIA Laser Hair Removal Device, I am hair free. The Makeup Examiner really has nothing negative to say about the TRIA Laser Hair Removal Device other then if you want to be hair free for summer, start now! Any question that one may have regarding its use can be found directly on the TRIA website, which by the way is currently running a special. 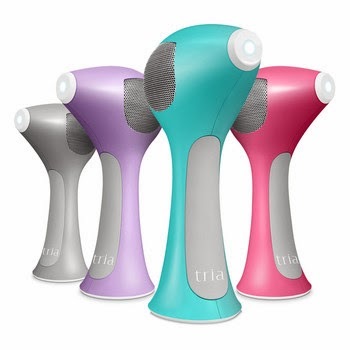 TRIA Laser Hair Removal Devices can be purchased at the brand’s website and select retail outlets.